Nickelodeon, the kids’ entertainment channel, has upped the fun and entertainment quotient for children this quarter. 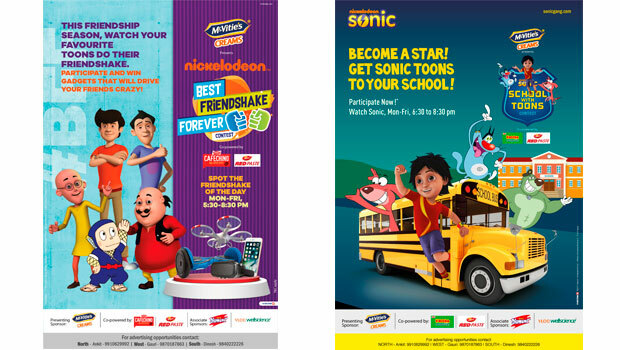 The franchise has flagged off a high octane on air campaign “Nickelodeon Best Friensdshake Forever” and “Sonic School with Toons” contest, presented by McVitie’s Creams and co-powered by Parle Cafechino, Parle Kachcha Mango Bite and Dabur Redpaste. The campaign will be brought alive on-ground by a high decibel school contact programme across 650 schools spanning over 20 cities. Nickelodeon’s school contact programme is all set to make sure that children celebrate the best years of their life in school. The school contact programme will engage with kids across the country from metros like Mumbai, Delhi, Bangalore, Chennai to the smaller towns and cities like Bhopal, Lucknow, Nashik, Jaipur, Chandigarh etc. Kids will be treated to interactive games, trivia questions, sampling and exciting goodies that will make a day at school exciting. Nickelodeon’s Best Friensdshake Forever will see kids create their version of the cool and edgy friendship shake. Friendshake Forever contest will give kids a chance to win fabulous goodies like drones, hover board, Iphones and VR headsets by tuning in to Nick every Monday to Friday from 5:30-8:30 pm. Kids need to do watch their favourite shows – Motu Patlu, Ninja Hattori and Gattu Battu in action and count the number of times their amazing Friendshake is flashed on screen. “Sonic School with Toons” will provide kids with a once-in-a-life time opportunity of meeting their favourite toons, Shiva, Oggy and Doggy Don, in their very own school. The kids need to tune in to Sonic every evening from 6:30-8:30 pm, watch Pakdam Pakdai, Shiva and Oggy and the Cockroaches and count the number of times the characters are flashed on-air to get their exclusive time with the amazing toons.